"How/why did you become involved with the computer in producing art?" My involvement with the computer is the consequence of a long-standing interest in art-and-technology that extends back to the very beginning of my career in 1936. My first enthusiasm was the Mexican school of mural painting and my model was David Alfaro Siqueiros, who as early as 1932 was advocating a revolution in the technology of art. For Siqueiros this meant using the airbrush and synthetic automobile lacquers to paint his out-sized propaganda murals, and I began by following in his footsteps. During the forties I was experimenting with both acrylic and polyester plastics, with fluorescent dyes and pigments, and spent a couple of months researching a cinematographic approach to kinetic sculpture based on what I described as 'multiplanar sequential image projection.' In 1951 I constructed an eight-bladed stroboplane to test the principle, and demonstrated the device in a one-man show in Los Angeles a year later. Along with some drawings on plaster I also displayed a cluster of transparent fluorescent sculptures illuminated by black light. These latter triggered my first publicity break—a full page color reproduction in Time. I turned to the computer in 1967 on learning for the first time about its ability to generate and transform images. Almost immediately I realized that my earlier idea of multi-planar image synthesis could be used to describe three-dimensional forms within the computer by slicing and stacking them as two-dimensional shapes—something like a contour map. The result was my computer sculpture program TRAN2, the first version of which was written in 1968 for the IBM 1130 system at Amherst College. 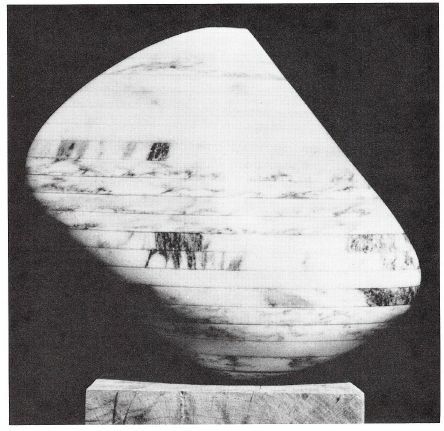 'Quad IV', Iaminated marble, 11 inches high. The computer sculpture program TRAN 2 was used to design the sculpture and draw the cross sections, which were transferred to the marble slabs and traced. The slabs were cut out, Iaminated together with epoxy, then ground to a smooth contour and polished. My reputation, such as it is, is based not so much on my activities in art-and-technology and with the computer as on the Neo-Dada and assemblage constructions I was doing in New York about 1960. However, even this 'junk art' could not have been made but for polyester resin, which I came across in 1946 as a consequence of my explorations in art-and-technology. But I gave up using all plastics, solvents and spray cans after 1962 on learning they were poisoning me, and for the five years before dis- covering the computer, had virtually no explicit involvement with art-and-technology. The year 1967 was crucial for me in a number of other ways. It was the year I began teaching at the University of Massachusetts in Amherst and had the opportunity to try out computers, and it was also about that time that art-and-technology shook the art world—thanks mainly to Robert Rauchenberg and his friends in the Experiments in Art and Technology group (E.A.T.). Unfortunately, this high-octane group, after launching art-and-technology in this country, promptly sank it with a series of technically amateurish and Pop-ridden exhibitions that were not long in giving art-and-technology a bad name. Those of us who are really serious about art-and-technology (and have stuck with it during hard times) are still paying the price. But things are looking better. For since its nadir about 1971 the movement has been reviving. In fact, its prospects might even be called promising now that it has struck up an alliance with the computer and has achieved a solid base of operations in a few key colleges and universities. However, the artists and engineers who organized E.A.T. should be given their due. Although they certainly did not invent art-and-technology out of whole cloth (whose roots are as diverse as Constructivism, the Bauhaus, and the Mexicans—to mention only a few), they nevertheless managed to contribute a catchy if less than euphonious name for a movement that had long been in need of one. In sum, my art background is art-and-technology, and my enduring interest is the potential of science and technology for art. The power of the computer in art is that it can play a variety of roles, many of them cybernetic, or 'brain-like'. The computer, like any tool or machine, extends human capabilities. But it is unique in that it extends the power of the mind as well as the hand. Hence, a clear distinction must be made between this brain-like function and the output instrumentalities (like film, video, photography, holography, kinetic sculpture, graphics, light art, etc.) through which this power is expressed. This explains why the computer is not an art medium as such, and why the phrase 'computer art,' if used to convey this meaning, is a misnomer. Properly defined, the role of the computer is that of a key cybernetic component in a host medium, art form, or art-generating system where it performs a variety of functions, some of them far more sophisticated than others from a cybernetic standpoint. In other words, some of them have more to do with the brain than the hand, and in this respect are more portentous in their long-term implications for art. And it is these cybernetic implications that interest me the most. For example, one artist might use the computer for its speed, precision, and implacable tirelessness; another for its ability to imitate biological, physiological, or psychological stimulus/response interactions; another for its ability to simulate other kinds of art; another as a way of mediating the flow of energy and information within a transductive system (as when sound ignites the visual kinetics on a CRT or video display); another for its ability to regulate precise and fast-moving performances (as in a kinetic laser system); another for its ability to calculate the minute 'iterations-with-a-difference' of a spiralgraphic-like composition; and another for its ability to calculate a hologram, or the small differences of imagery in a stereo pair. '2-color computer graphic', 9¾ × 9¾ inches, 1972. A two-color plotter graphic made on the Amherst College IBM 1130 system. The program, called GRAF/D, was written in Fortran IV by the artist. The program stops while the pens are changed by hand. Felt tip and ball point pens are combined in the same drawing. As for myself, although the underlying concept of TRAN2 has yet to be fully implemented, eventually this sculpture program will exploit the computer's interactive 'conversational' capabilities to speed and enhance the design of sculptural forms, continuously shaping and reshaping them by means of a large library of transformation algorithms and routines. 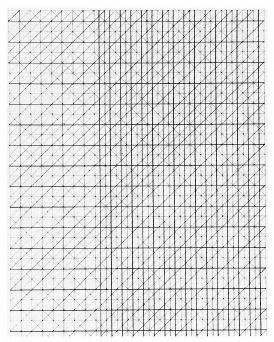 Another program of mine, called GRAF/D, uses the plotter for no better reason than to draw a grid of lines straighter, faster, and more evenly than I could by hand. Yet another program, called TRPL, uses the machine to calculate the interpolations between a set of master lines, while also incrementing and decrementing the intervals between the lines. In this case these microscopic nuances are beyond my ability either to calculate or to draw. '3-Color Computer Graphic', 12¾ high × 9¾ inches wide, 1972. A three-color graphic made on the Amherst College IBM system. The program, called GRAF/D, was written by the artist in Fortran IV. The program stops while the pens are changed by hand. Felt tip and ballpoint colored pens are combined in the same drawing. But within the context of the computer itself almost all of the capabilities I have just mentioned are somewhat on the order of mechanical skills when compared to the computer's truly cybernetic potential. This comes into play when the computer begins to make aesthetic distinctions, choices, and assessments, and when it has been programmed with the information needed for it to organize and compose art of a superior quality automatically and seemingly 'on its own.' Used this way, the computer can be turned into a marvelous tool for research in art theory and aesthetics, and for testing the structural syntax, principles, devices, and ratios against the quality of the serial output. Because the computer is preeminently a calculating machine it can output as alphanumeric listings the quantifiable features and relationships needed for close study and analysis. SHAPE was written five years ago as a start in this direction, and last summer its name was changed to SHAPE3/D when it was enlarged as a 3-dimensional program for organizing a repertoire of solids into various kinds of compositions, some simple and some complex. Thirty parameters can define an enormous range of forms, features, and compositional set-ups which can be rotated for viewing from any arbitrary perspective. The ratios of size, spacing, height, color, empty-to-filled space, and other characteristics can all be prespecified within an approximate range, while using the random number subroutine to generate the 'variety-within-specified-limits' which is the essence of the approach. Last summer an interdisciplinary group of artists, environmental planners, and computer specialists on our campus was funded by the National Endowment for the Arts to study the aesthetic aspect of stripmine reclamation, approaching it from the standpoint of landscape design and large-scale environmental sculpture. This is very much a computer-oriented project in which we will be combining into a single integrated package a number of the computer capabilities just enumerated. For example, using the system in its interactive mode, the designer/sculptor will compose landform arrangements based on a substructure of geometrical primitives, which at the right moment can be joined and unified by a curve-fitting algorithm that scans the topographical surface. Or, put into the automated mode, the computer will suggest ideas of its own—all of them in accord with a complex web of criteria that, in addition to the explicitly aesthetic specifications, also includes environmental, land use, cost, and other requirements that must be considered. These plans and designs will then be out-putted in a variety of visual forms (film, video, stereo, CRT display, plotter, etc.) for the more efficient and vivid communication of this visual information. What I am describing, of course, is an ultimate objective. Our immediate goals are more modest. In short, the 'role' of the computer for me is precisely its diversity of roles, most of them cybernetic in some way or degree. Definitely yes—particularly to the geometry and formalism of Constructivism and Neo-Plasticism. In fact, the more geometric and mathematically-based kinds of computer art (like spiralgraphics) might even qualify as a subset and off-shoot of Constructivism, which in turn is likely to be both revitalized and broadened by this new development in art-and-technology. And the same holds for Op Art, in which are buried a number of still unexplored potentials that only a computer can uncover. Although the moire patterns generated by my program TRPL are surely not Op Art as such, they suggest something of what I have in mind. It is a common fallacy that artists simply copy a ready-made image that is fixed and unchanging in the mind's eye. The error here is in thinking of the creative process as essentially static and undialectical. The start-up stage for most artists is a rather vague idea that evolves towards definition and completeness in the course of the work itself (and in the case of Abstract Expressionism and gesture painting this open-ended strategy is practically a sine-qua-non). Moreover, contemporary artists are likely to jettison the original idea completely if something better happens along while the work is underway. I can't see that the computer changes this very much. In developing, then using a program so as to express the original idea, there are usually experiments with the parameter settings to get the most out of the program and optimize the output. Or in the course of debugging a program, the output might reveal a possibility that could not be foreseen when the program was first planned. However, I would hazard the generalization that the greater the power, scope, and versatility of a program, the greater the possibility of these unexpected discoveries. In fact, one of the delights of complex programs with many parameters is these surprising productions. And this also points up that one has to learn how best to use a program once it has been written. '4-Color Computer Graphic', 9¼ × 9½ inches, 1972. A four-color plotter graphic made on the Amherst College IBM 1130 system. The program, called GRAF/D, was written in Fortran IV by the artist. For making this drawing the program was run through twice, once for the upper half and again for the lower half. Each drawing is one-of-a-kind. "Could your work be done without the aid of a computer? If yes, why use the computer?" My program GRAF/D does nothing but draw straight lines in grid-like patterns. I don't doubt there are thousands of artists who could draw similar graphics by hand if they were of a mind to. But I couldn't—or more precisely, wouldn't—because I'd either be climbing the walls, or making blotches on the next to the last line. Although this use of the computer can hardly be called cybernetic, it is still a sufficient excuse to use it. Mere convenience is a justification, just as we use machines to do many things we are able to do without them. But we use them nevertheless—and why not? And why not use the computer just for its convenience when making certain kinds of art? TRPL is another cup of tea. In this case it would be plain madness to attempt to calculate, then hand-draw the precise scheme of lines and spaces required for generating the moire patterns that are so important to this series. This same question might also be relevant to the three or four sculptures I made in the late sixties using TRAN2 as the program. Since these works appear to be rather conventional examples of abstract volumetric sculpture, it is difficult to perceive what role the computer played. But rest assured, it did play a role at the design stage, even though its contribution is not apparent. What is missing here, of course, is an output medium that matches the computer in its contemporaneity—something like holography, for example. In fact, I am still looking for that medium, and the delay in finding it explains in part why the punch cards for TRAN2 are resting on the shelf. "To what extent are you involved in the technical production of your work, for example, in programming?" At first I was unable to do any of the programming I needed and I relied mainly on students and paid assistants. But I have since learned some Fortran, enjoy programming as a designing and problem-solving activity, and wish I had the time to become better at it. And if need be I can pinch hit for Dave Backer, a student in the computer science program who helps me teach the Computer Graphic Workshop we have going at the University of Massachusetts. When confronted with a really formidable programming task, however, I like to work with an expert. In this case my contribution is to specify the over-all character and purpose of the program, insist on some user-oriented features, and help in defining and naming the variables and parameters that are needed. By knowing something about programming myself I can work more effectively with the programmer. But I have yet to come across any canned program or so-called graphics language that can do any of the things I am likely to ask of a computer (a possible exception is Ken Knowlton's EXPLOR, which I look forward to trying out now that it has been implemented on our UMass CDC KRONOS system). Occasionally I come across a program that I admire very much, like Jeff Bangert's simulation of the hand-made art his wife Colette was doing some years back. In this kind of situation I feel challenged to test whether I might obtain better results from the program than its authors (in fact, I put the challenge to them once). Or perhaps results of the same high quality, but of a different character. However, the Bangerts are not about to let this program out of their hands, and I certainly don't blame them. This sophisticated program is much too personal to throw to the winds, or even to put into the hands of a trusted friend. 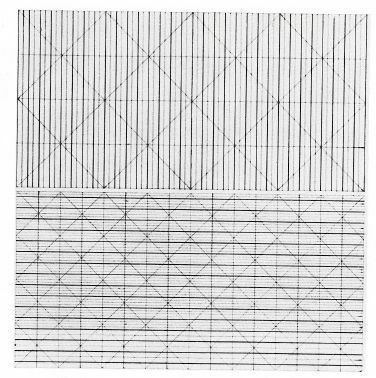 '2 Color Plotter Graphic', 4×5 inches, 1973. 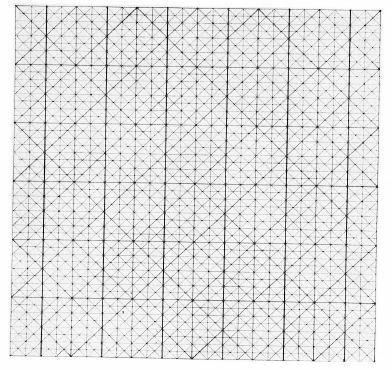 A two-color plotter graphic made on the Amherst College IBM 1130 computer and plotter. The main program (called TRPL) was written by the artist. A curve fitting subroutine (called XFIT) was written by Dr. Roger Ehrich. The program interpolates a series of lines between a master line on the left and another on the right. A third master line is used to graph the spacing between the lines. 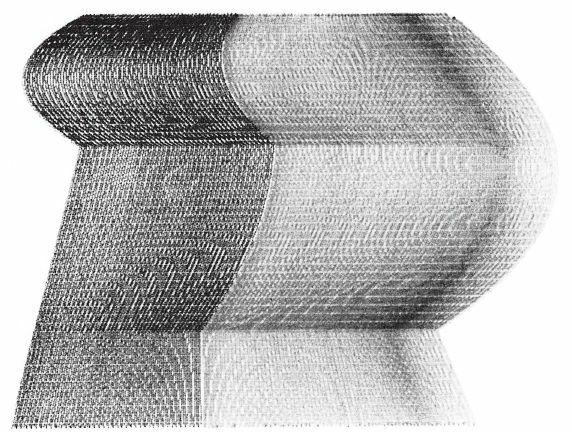 The moire patterns result from the interaction between the spaced lines with a peculiarity of the pen, which is restricted by a system program to moving either vertically, horizontally, or at some increment of 45 degrees. Those aspiring to a serious involvement with the computer should trouble themselves to learn something about programming, even if they have no intention of ever becoming experts. Nor does mastering one of the easy-to-learn graphic languages qualify anyone as a programmer. Real programming requires a close analysis and clear definition of the task to be performed, then an ability to design a program and devise the required algorithms. This is an intellectual discipline of the first order that has a potential in education beyond the technicalities of programming computers. I am also convinced it can play a role in the education of art students by helping them to think and discuss what they are doing more explicitly and analytically. At least, this is a major part of the philosophy behind our Computer Graphics Workshop and its teaching of Fortran to art students. "Do you feel art work created with a computer has now or will have an impact on art as a whole in the future?" Computer art has yet to make much of an impact, but it will. In fact, if I were not confident of its future I would not be interested in computer art, because the current level of performance is simply not that impressive. At this point I am charitable in judging both my own work and that of others (the question I throw back is: "What good is a baby?") But as time goes on standards must, and will, stiffen. Even now it is time to move beyond the easy gimmicks towards more substantial achievements. Yes, even despite the constant irritation and frustrations of not having the resources to achieve what I know in my bones can be accomplished by means of the computer. Here again, I am inspired not by what is currently being done, but by what I know is possible. "Do you recommend the use of the computer for others in creating works of art?" Those who are right for computer art will find their way to it. But a minimal critical mass of information must be available and circulating. In fact, this collection of statements, articles, and material prepared for 'Artist and Computer' should help a lot.